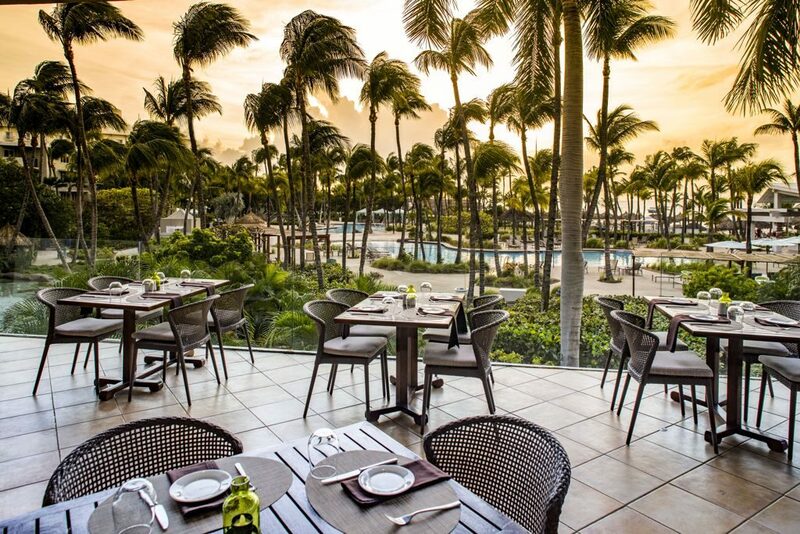 ORANJESTAD — Aruba’s Diamond Jubilee Carnival is at its height, with the final parades and events taking place over the next ten days. 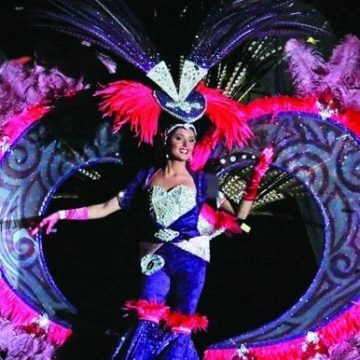 The streets are filled with the sound of music and lavishly costumed dancers, and reigning supreme over all this is Aruba’s landmark anniversary Reina Grande, Zuriah Flemming of Meta Social Club. Meta Social Club is a newly formed carnival group, which is making quite a splash with first year of participation. 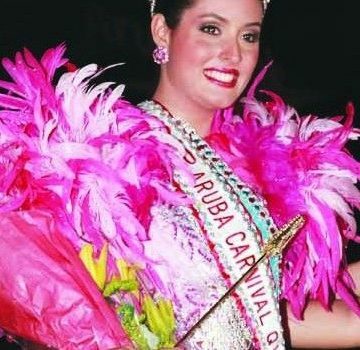 Monday of last week, their entry for Mrs. Carnival, Lynette Bernadina, took that crown, and their statuesque entry for the top queen, Zuriah, was crowned by Aruba’s Prime Minister, Mike Eman, on Friday evening, February 21. 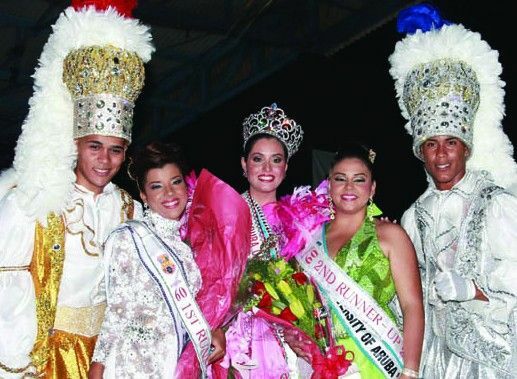 Since this is a landmark carnival, the organizers of the queen pageant put on an exceptional show, and welcomed three well-known Venezuelan TV celebrities among the judges. The dance troupe from that country’s major TV station, Venevision, put on a fantastic dance show and Aruba’s Tumba King, Jorrino Ridderstap, entertained. But the stars of the evening were the seven candidates with their fantastic costumes, glittering gowns and spectacular productions. The numbers were elaborate, focusing on celebrating Aruba and its carnival in its content. Zuriah, along with Ziazian Goeloe, Jasmin Marin of Santa Cruz, San Nicolas Queen Souhaila Kock, School Queen Xenia del Rosario, Adeline Martinus of Royal Carnival Group and Thania Lacle, representing the University of Aruba, displayed quite some charisma and vitality during their shows, giving the judges a tough job in picking the winners. Finally, the winners were announced. 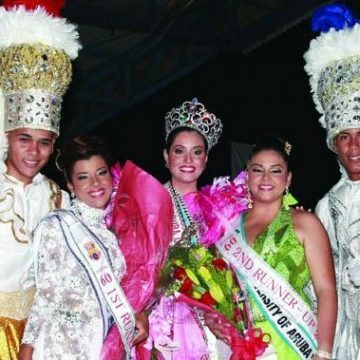 Though all competing for the title were spectacular, the judges were particularly impressed with Thania Lacle, the queen from the University of Aruba, who won the awards for Best Show, Best Speech, Best Costume, and Best Make-up, earning her a special prize from sponsors, Aruba Trading Company and Revlon, as well as the trophy of Second Runner-up. 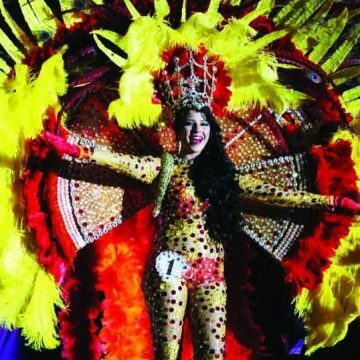 Ziazian Goeloe is a veteran to carnival queen elections, having taken the First Runner-Up trophy in the Youth Queen pageant only a few years ago, and was named First Runner-up in this year’s Reina Grande event. 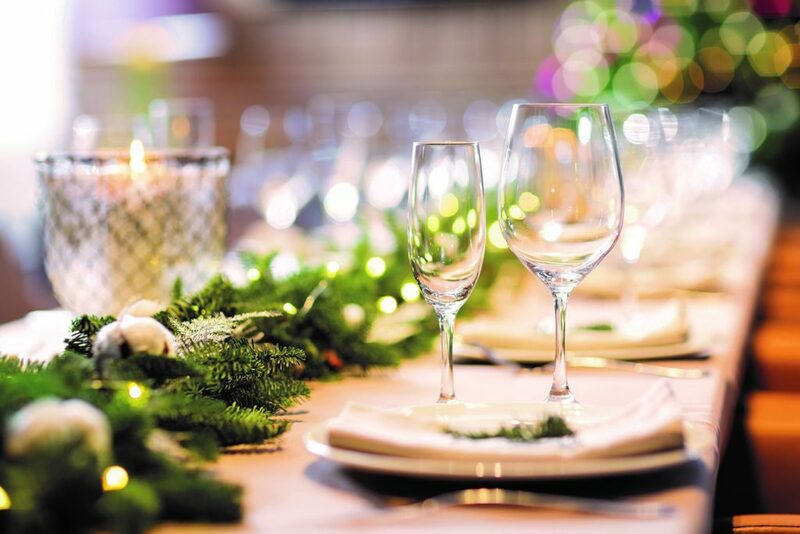 At this point, the question of winner was moot, after Zuriah had also won the SETAR Queen sash from Aruba’s national telecommunications company, with 28.7% of the SMS votes. 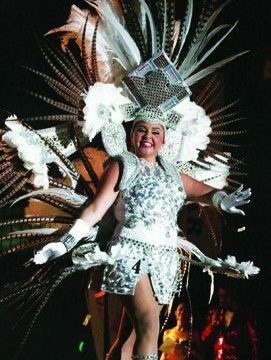 She also was named Most Popular, but was still overwhelmed when she was named queen, she had heartfelt hugs for Jordano Hilario, Prins 60 and Emon Webb, Pancho Rebienta, as they singled her out from the queen line-up. This important Diamond Jubilee Carnival event also earned the new queen a special trophy from Stichting Arubaanse Carnaval (SAC) the foundation that organizes and administrates carnival events. It was presented by President of SAC, Tecla Kelly. Aruba’s contingent of Diamond Jubilee Carnival Royalty is now complete, with their new Queen Zuriah reigning supreme over the remaining parades and events!